At long last, Batman and his team have gained access to the Phantom Zone. Inside the interdimensional prison, the Teen Titans remain trapped since the early days of Superman’s reign of tyranny. Will they be able to escape their prison? Will another obstacle try to get in their way? Or most importantly, how have they changed from their imprisonment? The Phantom Zone is being held within Superman’s Fortress of Solitude and current home to the Kent’s. Batman and his team (sans Harley Quinn) are allowed inside to try and gain access to it. 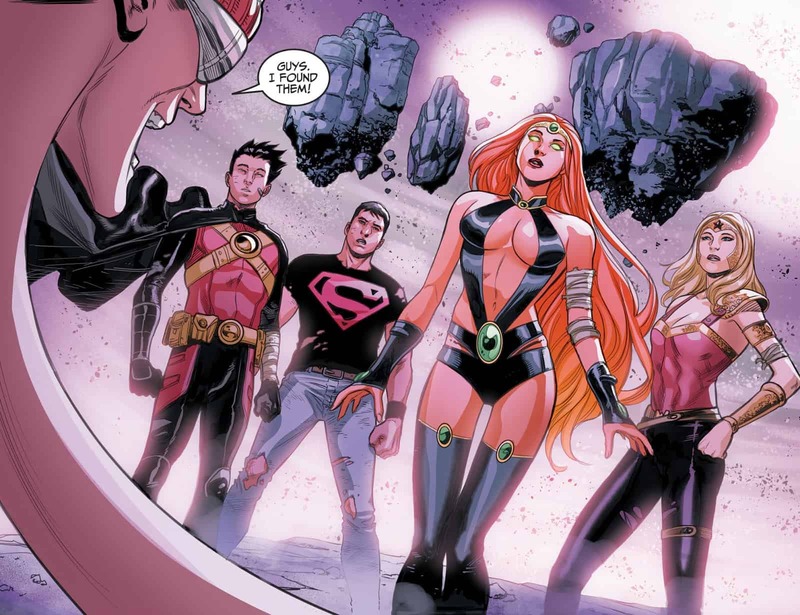 Their hope is to free the Teen Titans to add them to their roster. Namely as a means to deal with Ra’s Al Ghul and more importantly his new weapon AMAZO. Picking up immediately where chapter 37 ended, Plastic Man is searching the Phantom Zone for the Teen Titans. Extending his arm back to his son Luke as a tether so he can find his way back. There’s no immediate sign of the team and Plastic Man feels like he’s being followed. The feeling is pushed aside when he discovers several massive floating stone platforms holding a number of Phantom Zone prisoners. Plastic Man being Plastic Man, decides to ask them for directions despite Luke’s warning. His idea works when he discovers Imperiex and does as he plans. Plastic Man shapeshifts into Superboy and gets directions from the supervillain to Teen Titans. At long last; Red Robin, Superboy, Starfire, & Wonder Girl have been found. They’re surprised to see Plastic Man and he gives an extreme summarization of Injustice’s more outlandish exploits. Namely Ch’ps death, Detective Chimps appearance, and the recent resurrection of Alfred. He asks them to follow his arm so they can escape. But Superboy says he can’t and with Starfire explains about his fatal injury at the hands of Superman. Robin keeps hope alive and says they’ll come back for him when they find a way to save his life. 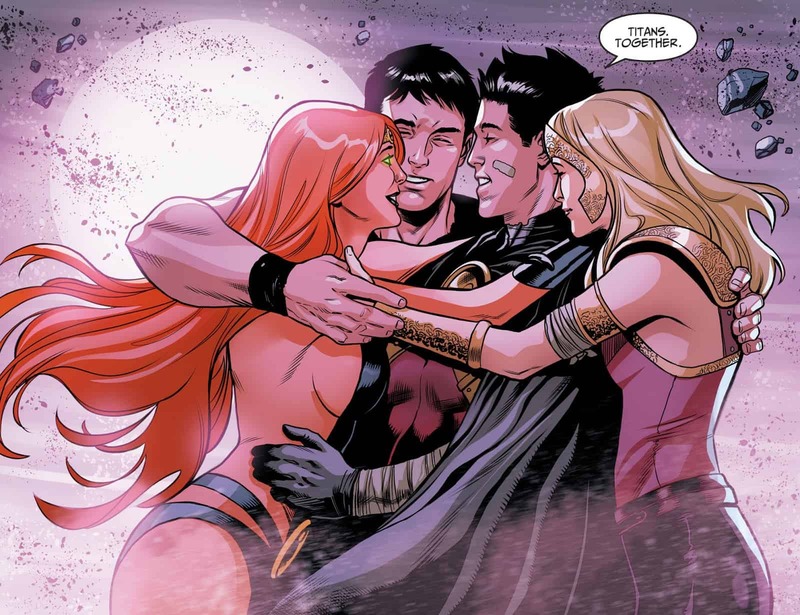 Superboy tries to get them to just abandon him but the Teen Titans dash that plan with a group hug. Reaffirming their bonds before having to leave him. 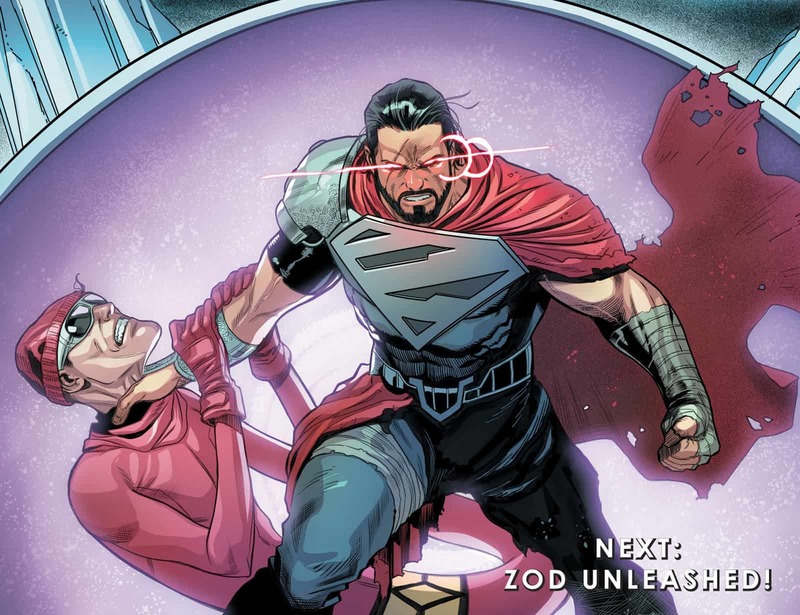 Not even five minutes out of the Phantom Zone and Red Robin is (presumably) killed by General Zod. The only character sans Scorpion from Injustice 1s DLC who never appeared in the comics knows how to make an entrance taking out Red Robin in one move while holding Plastic Man by the throat. All the while showing off his more fitting redesign. It’s safe to assume the Titans are going to have to prove themselves as effective combatants for AMAZO. Before the dark swerve ending, it was really nice seeing the Titans again. A literal reminder of the better times before everything went to hell. Down to Red Robin still being hopeful and optimistic about the world. It was a legitimately awesome and sweet moment. Red Robin being more than likely killed even fits as a symbolic sign that they just aren’t ready for the darker world they’ve missed. I will admit it does kinda give me vibes of darkness induced apathy but at the same time, I feel it makes sense in that this was entirely avoidable. Namely, if they had just listened to Plastic Mans. A fact I’m sure will be brought up next issue.